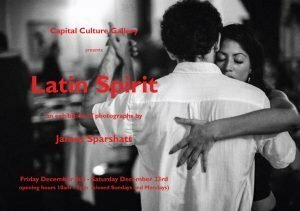 Capital Culture Gallery is excited to present Latin Spirit: An exhibition of photographs by James Sparshatt. This will be the first exhibition in our Colitshall space. James’ black and white photographs of music and dance from the Latin world will take centre stage. From the 8th December to the 23rd December you can escape from the cold and warm yourself with images of Salsa, Flamenco and Tango. During this time we are extending our opening hours to Tuesday – Saturday 10am – 5pm. There will be a private view on the 7th December at 6pm. If you would like attend this and enjoy a mojito with us then please RSVP to info@capitalculture.eu. In addition to that on the 16th December there will be a talk by James himself about his work and his experiences. These talks are popular events and places are limited. Therefore if you would like to attend then please let us know as soon as possible. Tickets for this will cost £5 with all proceeds going to Coltishall and Horstead Preschool’s Development Fund. To book your place please email info@capitalculture.eu. In the meantime If you would like to see more of James’ work before you come please check out his page here. Make sure and click “attending” On our Facebook event here. The exhibition runs from Friday 8th December – Saturday 23rd December. The opening hours are Tuesday – Saturday. 10am-5pm. The talk starts at 4pm.